Blending timeless Arts and Crafts touches with the finest of modern family living, The Richmond is a home that is as beautiful as it is practical. This 4 bedroom home, set over 2030 square feet, offers a fantastic quality of life that exceeds the very highest standards. 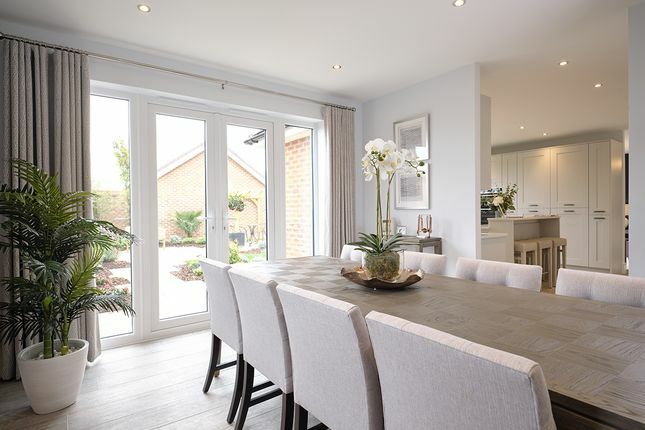 The capacious open plan kitchen with adjoining dining and family areas to the back of the property is sure to become the heart of the home. A separate lounge is perfect for quieter moments, while additional rooms such as the utility room and garage serve all of your practical needs. The master bedroom enjoys the height of luxury, with both an en-suite and dressing room. 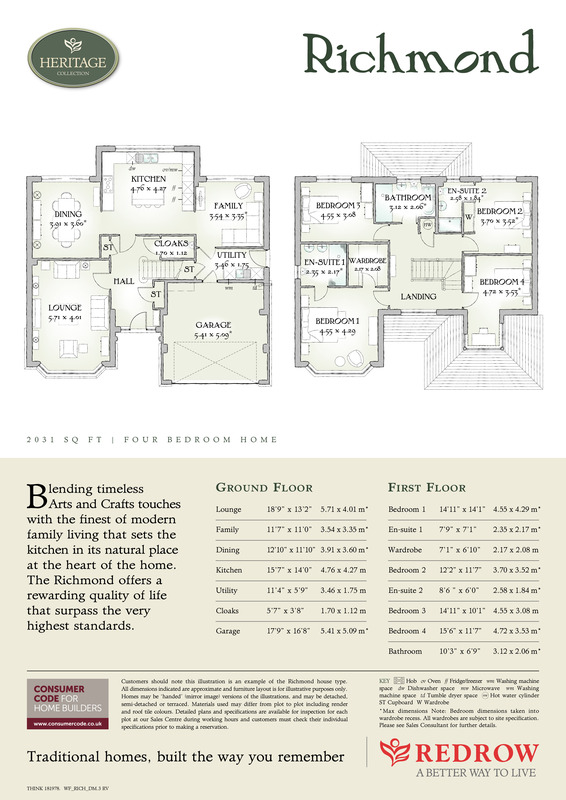 The 3 other bedrooms are all generously sized and decorated in the most elegant, contemporary style. The opening of a brand new £90m shopping centre in 2015 heralded the start of an exciting new future for Newport. No longer living in the shadow of nearby Cardiff, Newport is emerging as a superb shopping and leisure destination in its own right. And with Carnegie Court, just two miles from the city centre, you can make the most of all the superb opportunities this presents. Carnegie Court is a development of 3 and 4 bedroom family homes near Newport, offering exceptional quality and value for money. Register your interest today and be the first to know the news and you’ll get the pick of the plots on this popular development when they are released. There is a Spar convenience store on Bassaleg Road and a Lifestyles store by Pye Corner Station for your day to day needs, along with a Tesco Extra supermarket less than a mile away on the edge of the city. For dentists try Cardiff Road Dental Practice (Sat Nav NP20 2EN, call . You’ll find a great choice of places to eat close to Carnegie Court, without having to venture into the city. The Ruperra, Junction 28, The Friendly Fox, the Tredegar Arms and The Rhiwderin Inn all come highly recommended. Within Newport itself, you’ll find an even wider choice, with Gemelli (Italian), The Secret Garden (European), Le Bistrot Pierre (French), Shoboraj (Indian) and Dutchy’s Jamaican Jerk Shack topping the Trip Advisor listings. Newport boasts some excellent schools, many within easy reach of the development, ensuring the very best start in life for your children. Nearby primary schools include High Cross Primary, rated ‘excellent’ by estyn, Glasllwch Primary, rated ‘outstanding’ and St David’s rc Primary, rated ‘good with outstanding features’. Welsh Medium schools include Ysgol Gymraeg Ifor Hael Primary School and Ysgol Gyfun Gwent Is Coed at secondary level. Older children are just as well served, with a choice of the ‘good’ rated Bassaleg School close by and St Joseph’s rc High rated ‘excellent’. Sport or leisure, taking part or just taking it easy, Newport has something for everyone. You can take a stroll around Tredegar Park and Country House, or head north to the Brecon beacons for a more challenging hike. You can watch top class sport with championship golf at Celtic Manor and international rugby and cricket in nearby Cardiff. Or you can get involved with lots of local sports clubs, including Stow Park Lawn Tennis Club, and Risca Leisure Centre. For evening entertainment, Newport has a choice of the Dolman Theatre or the Riverfront Arts Centre, along with a multi-screen Cineworld Cinema for all the latest releases. The brand new £90m Friars Walk Shopping Centre is the jewel in the crown of a revitalised Newport, anchored by major names such as Debenhams and Marks & Spencer. This superb new centre offers a huge range of stores, along with cafes and restaurants, making it a real hub of city shopping. The city also boasts the Kingsway Centre as well as the out of town shopping of Newport Retail Park. Just a short train ride away, Cardiff offers a cosmopolitan shopping experience, while the huge malls of Bristol are famous for miles around. Carnegie Court is perfectly placed for commuting, with the junctions 27 and 28 of the M4 just a few minutes drive away and the A467 passing close by. Newport City Centre is just 2miles, Cardiff just 12miles and Bristol, via the Severn Bridge, just 34miles. Pye Corner Station is within walking distance, with regular trains to Cardiff in just 22minutes, while Newport Station has trains to Cardiff in 15minutes, Bristol in under an hour and direct to London Paddington in 2hours 20minutes. Property descriptions and related information displayed on this page, with the exclusion of Running Costs data, are marketing materials provided by Redrow - Carnegie Court, and do not constitute property particulars. Please contact Redrow - Carnegie Court for full details and further information. The Running Costs data displayed on this page are provided by SmartNewHomes to give an indication of potential running costs based on various data sources. SmartNewHomes does not warrant or accept any responsibility for the accuracy or completeness of the property descriptions, related information or Running Costs data provided here.